An exquisite compact plant with masses of bright scarlet and spider-like flowers. A striking compliant to any bed or border. 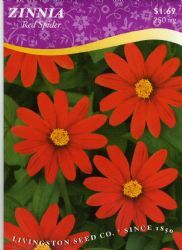 Blooms are approxiamately 1" in diameter, making Red Spider a very special Zinnia. Very easy to grow. Garden Tip: Plant with our White Cupid's Dart, Purple Coneflower, and Butterfly FLower for a beautiful color combination.